Last night on the way to Seattle to deliver my handsome GQ subscribing son home to his apartment, the subject of ironing came up. The kid is a clothes horse and likes looking sharp. He is now lobbying for a new steam iron and ironing board for himself. 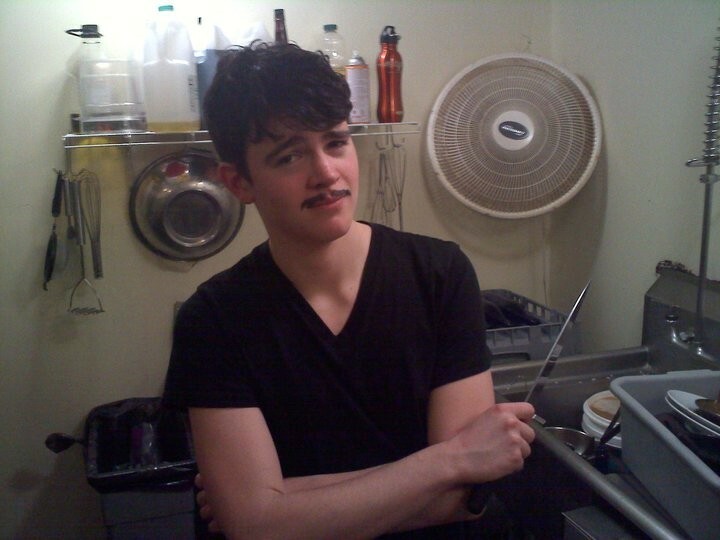 “There is no sound I like more the hiss of a steam iron when you start ironing your clothes. I really want to get an iron because so much of my stuff is natural fabrics that only look really good if they’ve been pressed.” Wow…this is my child…the one who dressed in whatever was first in the pile on the floor in junior high school. I’m happy to report times have changed, in a lot of ways actually. Terry was driving so we could have the Mom-Delivers-Ironing-Tips-and Things-Have-Changed conversation from the front seat to the back. Things like, if you press wool, either turn it inside out or use a pressing cloth, remember those? I started remembering my childhood and the saga of ironing clothes. 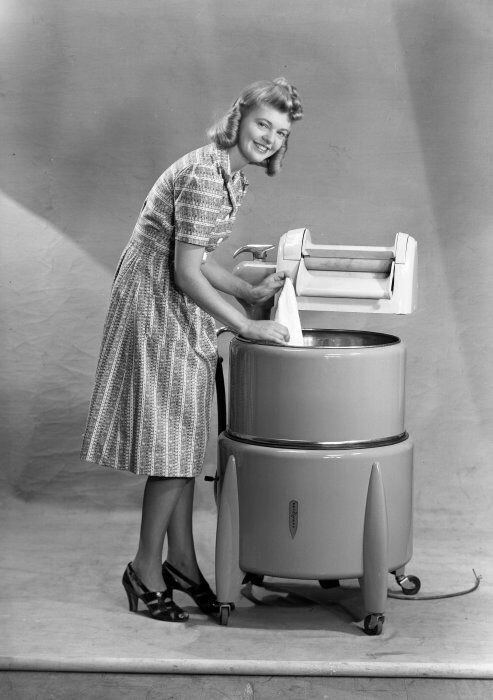 I actually remember as a really little kid, like around four years old, when we still had a wringer washer. I digress. We got a new top loader when I was about six years old and while it was much better it wasn’t exactly a rocket ship. Clothes got clean mostly, wrung out sort of, piled in a wicker basket and hung on the line to dry with clothespins that were kept in a bag made for the purpose. When they dried back in the day clothes were stiff, like clothes cardboard. This was way before anybody had thought up fabric softener and soaps and bleaches were pretty harsh in their chemical make up. I remember my thrifty mom insisting we hang the clothes out until I was out of high school. Of course, she had slave labor, me, to wash, hang up, take in and fold the clothes. I used the time to dawdle and daydream and the smell of clean air dried clothes is still one of my favorite smells. The joy of not heating an iron on the stove-and the advent of iron on patches. Once the cardboard was snapped out of the clothes they had to be ironed, no polyester or blends at the time. Rayon and nylon were around in primitive forms but were strictly dry cleanable and undies had to be hand washed, There was lots of silk still around for lingerie but most of our clothes were wool in the winter and cotton in its many forms for the rest of the year. All that cotton had to be ironed. Some ladies carried it to insane heights, even ironing their hubby’s underwear, my mom drew the line at that and just made me me iron the damned sheets. Somewhere my parents found a mangle, which is a commercial iron. A big padded wheel that turns inside a hot metal sleeve. Nasty, evil, hot, but it did stuff fast. I figured out to mangle everything because I was stuck as the designated laundress and spending a sunny Saturday ironing was not my idea of fun. Mangling my dad’s shirts took about three minutes versus over five ironing it. Before one could mangle, iron or otherwise flatten fabrics they had to be sprinkled. I remember big baskets of clean wrinkled laundry in the corner. The chore was to get them out, take a Seven up bottle with a sprinkler top attached and sprinkle the clothes with water. When they were damp they got rolled up in a ball and put in a basket like so many clothes cabbages. 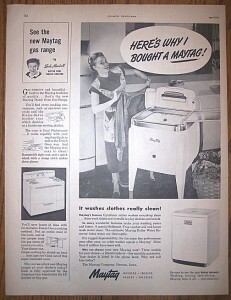 The whole thing was covered with a damp sheet and then the ironing began. 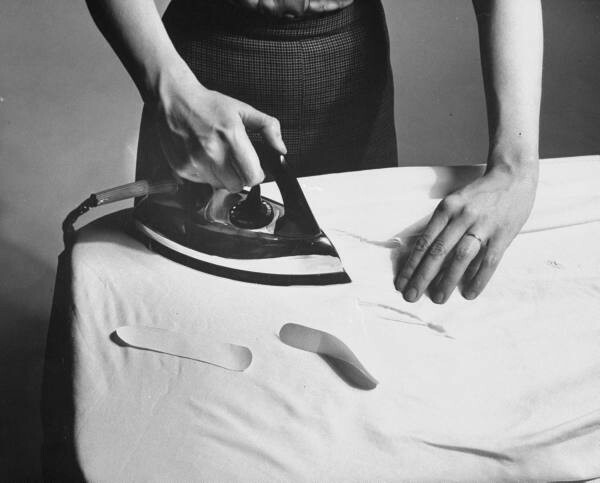 We didn’t have steam irons in the early 60’s and late 50’s. Heck, an iron that plugged in with a thermostat you could control was a big step forward. this is what my grandmother ironed with, nasty job, heated on the stove and held with a hot pad. I saw what my grandma had to use! 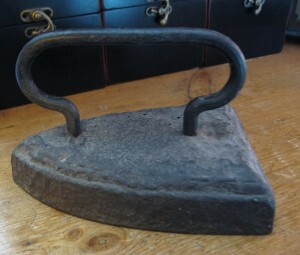 Sad irons, you heated them on a stove top and ironed fast until they cooled off and did it again. I actually have one of hers on my hearth. I really, truly appreciate my steam iron after trying that out once. At any rate, steam irons are wonders of nature and so are spray water bottles instead of the sprinkling kind. We take so much of this for granted, I can’t remember when I didn’t have spray bottles but now I’m curious about when they were invented and who first figured out that empty glass windex bottle would be perfect to fill with water. Bottles were always glass and cans were always tin, somehow we’ve moved away from that ecological soundness now, and my mission is to eradicate plastic from my life whenever I can, but that’s another story. 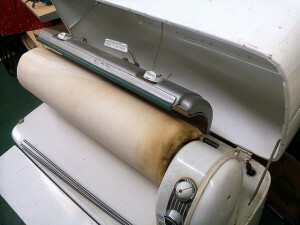 This entry was posted in Rabbit Remembers and tagged ironing in the 1950's, laundry on February 22, 2011 by rox.